Just bought Episode Pro 7 and I'm trying to use the channel configurator. I have a 16 channel ProRes and I need to map 7+8 to 1+2 and 15+16 to 3+4. I use Episode Pro 6 and the mapper is fine. 7 has a new option to map Tracks, I believe this is the issue. Can anyone help? Set Channel Mapping Mode to Manual and map as you like. See page 365 on in the User Guide. Thanks for the reply. Yeah, it doesn't work. I set Input channels to 16, max output to 4 and output tracks to either 1 or 4. It doesn't map either way. Episode 6 just had channels, Episode 7 now has tracks. 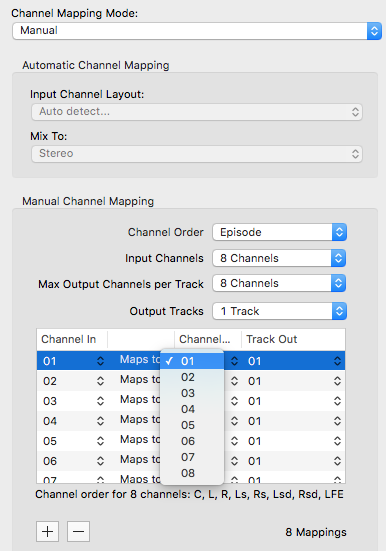 You can't seem to map channels from one track to another track. Can you include a screenshot of your complete channel map setting you're trying to do in configurator?